Unilever is voluntarily recalling a limited quantity of Ben & Jerry’s Coconut Seven Layer Bar bulk and Ben & Jerry’s Chunky Monkey pints, which may inadvertently contain tree nuts including almonds, Brazil nuts, and hazelnuts that are not declared in the ingredient list or allergy information list. Both affected products include a “Contains Walnuts” and a “May contain other tree nuts” label on the back of the pack. Persons who have an allergy or severe sensitivity to these undeclared tree nuts run the risk of a serious or life-threatening allergic reaction if they consume the recalled products. The affected Ben & Jerry’s Coconut Seven Layer Bar bulk product is sold in a tub containing 2.4 gallons with a Consumer UPC of 076840104246 and best by date of SEP1520BJ4. The affected Ben & Jerry’s Chunky Monkey pint is sold in a pint tub (473 mL) with a Consumer UPC of 076840100354 and best by dates of AUG2820BH2, AUG2920BH2, or AUG3020BH2. The products were manufactured in the United States. 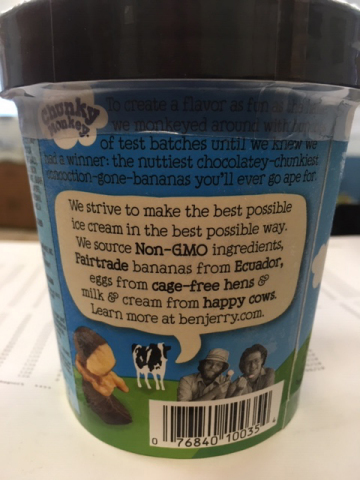 The affected Chunky Monkey pints were distributed nationwide and reached consumers through retail stores. The affected Coconut Seven Layer Bar bulk products were distributed nationwide and reached consumers through wholesale and scoop shops. No product was shipped outside of the U.S.
No other container sizes or best by dates of Ben & Jerry’s products – besides these specific lots of Coconut Seven Layer Bar bulk and Chunky Monkey pints – are affected by this voluntary recall, including other Pint Slices, pints or any other products served in Ben & Jerry's franchised Scoop Shops. The recall was initiated after an undeclared nut was found during the production operation. Unilever has not received any reports of illness associated with this product, but the company is voluntarily recalling this product out of an abundance of caution. Unilever’s ongoing investigation shows that the issue stemmed from an error from one of its nut suppliers. The situation has been remediated. Consumers who have purchased containers of the above products with the affected UPC and date codes are asked to immediately discontinue use of the product, retain the outer container, and call 833-236-1237 for further information 24/7. The company is placing a notification on the Food Allergy Research and Education (FARE) web site www.foodallergy.org. For additional information, please visit www.benjerry.com or unileverusa.com. Unilever is one of the world’s leading suppliers of Beauty & Personal Care, Home Care, and Foods & Refreshment products with sales in over 190 countries and reaching 2.5 billion consumers a day. In the United States and Canada, the portfolio includes brand icons such as: Axe, Ben & Jerry’s, Breyers, Degree, Dollar Shave Club, Dove, Hellmann’s, Klondike, Knorr, Lever 2000, Lipton, Love Beauty and Planet, Magnum, Nexxus, Noxzema, Pond’s, Popsicle, Pure Leaf, Q-tips, Seventh Generation, Simple, Sir Kensington’s, St. Ives, Suave, Talenti Gelato & Sorbetto, TAZO, TIGI, TRESemmé and Vaseline. All of the preceding brand names are trademarks or registered trademarks of the Unilever Group of Companies. Helping more than a billion people take action to improve their health and well-being by 2020. Halving the environmental impact of our products by 2030. Enhancing the livelihoods of millions of people by 2020. For more information on Unilever U.S. and its brands visit: www.unileverusa.com.